"Helping employees avoid injury and go home safe and sound to their friends and families is very important to me. Working toward enhancing our site's safety culture along with the supervisors and employees does make a difference." "We take a team approach to safety. We work together to maintain a workplace with safety as an attitude, a frame of mind and one in which everyone wants to participate in safety." Safety of people and the environment is one of Cameco's corporate values. While our policies reflect the importance we place on this value, it is employees like Cindy who bring this commitment to life every day. Cindy works at Cameco's Blind River Refinery, a plant recognized within the organization for an incredible safety record. Cindy's job is to oversee the refinery's health and safety management program. 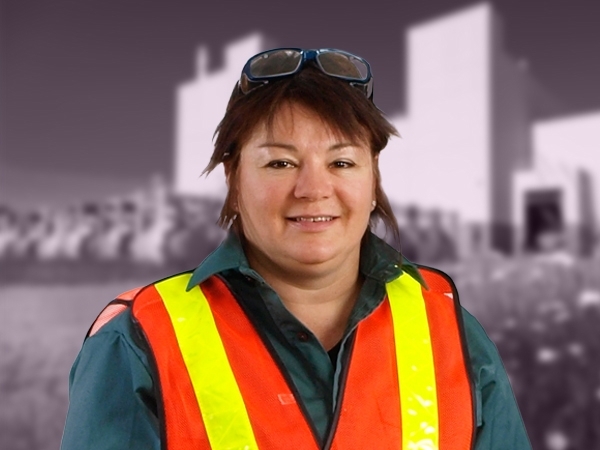 Cindy works with site management, supervisors and employees to keep everyone on site safe and healthy. She combines knowledge of the facility's processes with her understanding of health and safety principles and best practices to ensure procedures and tasks are performed as safely as possible. Constantly observant of the plant's operations, Cindy is also responsible for researching effective controls and finding solutions to health safety matters that arise. She works with colleagues from all areas of the refinery to not only proactively identify and resolve safety-related concerns but also provide training when needed to ensure each person on site is prepared to work safely at every task every day.